Fundamentals to mathematics are provided to help students master concepts that will later help them with upper-level classes such as Algebra, Trigonometry, and Statistics. Some topics include numbers; addition and subtraction of integers; exponents; multiplication and division of integers; polynomials; linear equations; inequalities; graphing; factoring; mixture word problems; investment world problems. One of the reasons why many students struggle with basic mathematics is due to various reasons. One reason can be a simple lack of confidence in their ability to succeed. Mathematics is a subject in which practice must be employed for ultimate success. Any kind of inconsistency in a students study pattern can affect one’s ability to comprehend and master material. In order for a student to be successful, proper time must be applied for concepts to be properly ingrained. 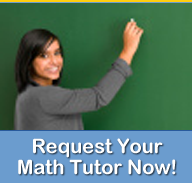 Math tutoring experts can provide that necessary assistance and guidance that many students desire to have. Understanding directions to problems can also lead to setbacks in grasping and completing questions successfully. A common example might be the difference between adding decimals as compared to multiplying decimals. Knowing how to find the answer can be frustrating to students and can lead to feelings of negativity towards mathematics. Math Tutoring Experts employs a system in which students not only will understand how they receive the answer but will also be able to differentiate what they are asked to do in terms of directions. Direct answers or shortcuts are not given by MTE, therefore training students to complete as much work on their own as possible. This creates a independence criterion which leads eventually to success. This approach will lead to more confidence and retention in the student’s ability to master their topics and therefore their subject matter. Lastly, MTE can expedite a students learning curve by showing students the proper way of studying mathematics. This employs techniques such as reading assigned texts; organizing notes; carefully going through examples; practicing problems. Basic math is designed primarily for high school students. Although, group training packages can also be purchased for community college students who may need a refresher course in these topics. Each MTE tutoring session can be purchased for 4 hour sessions time blocks with the options of 30 minutes or 60 minutes per session. Basic math sessions are held during the morning weekdays and weekends. Please contact MTE for more information about scheduling your tutoring session.